We’re in the full-scale food production phase of farm life now. Our days are filled with necessary work which an entire summer of gardening has brought forth. It’s also a time of year that there’s so many fun activities going on which makes it a challenge to fit both work and play in our schedules. Sometimes it means getting the day started at 5:00 in the morning. Many times it means late nights in the kitchen or butcher shop. Often we take turns reading out loud to help make a boring job more bearable. Most of the time we can split up the jobs between different sets of people making life interesting and not too monotonous. 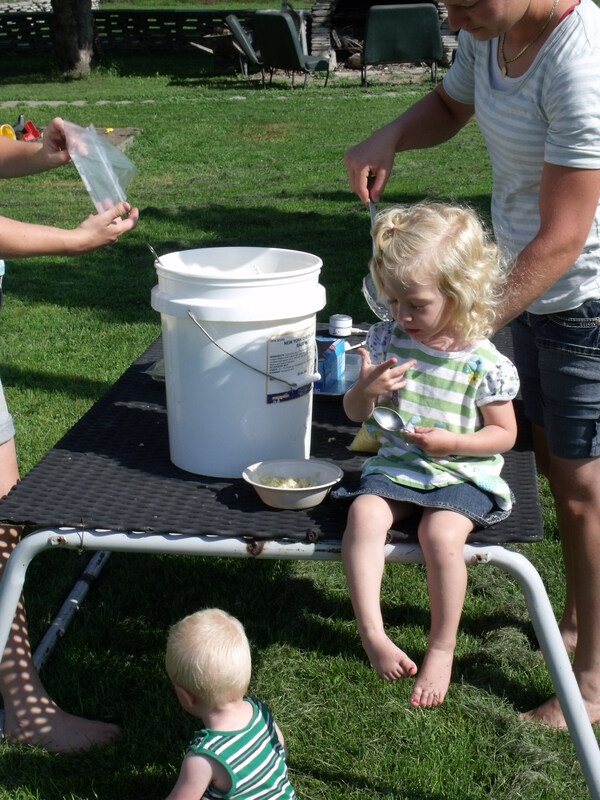 The sauerkraut is good enough to eat fresh out of the bucket. Kallie ate an entire bowl! 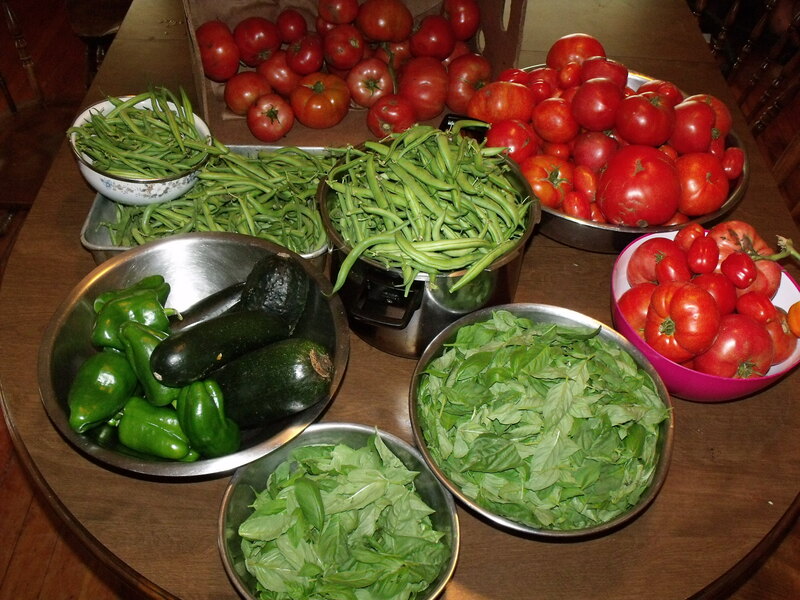 We’ve put up sweet corn, sweet peppers, sweet basil, sauerkraut, onions, frozen our zucchini and green beans, harvested some of our honey, made a ton of salsa and are working on more. The apples are coming in now and apple sauce is on the agenda every day. After that, there will be pies to freeze and apple cider. 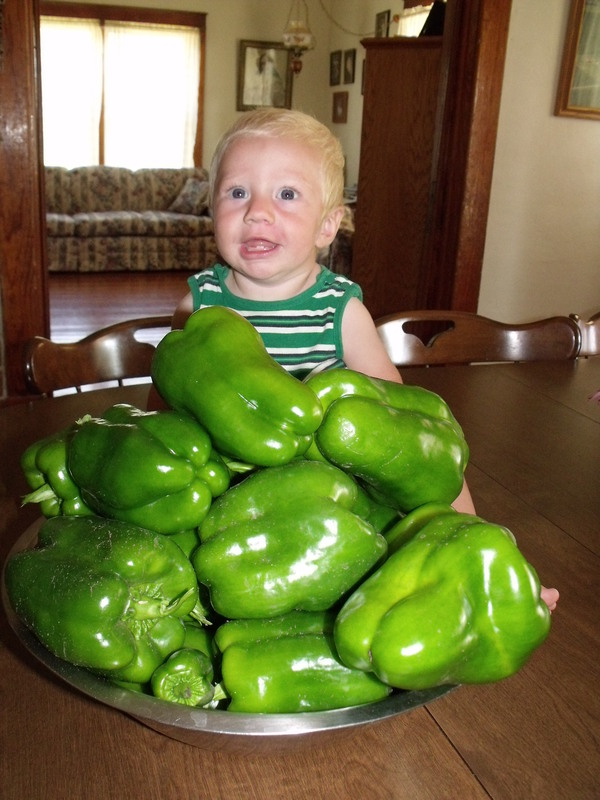 Sweet peppers, sweet baby Blase. Fresh produce is coming in daily. Fred’s been busy making wine and just last night he worked on a new batch of Elderberry. The grapes have been harvested and this year turned into wine instead of juice. 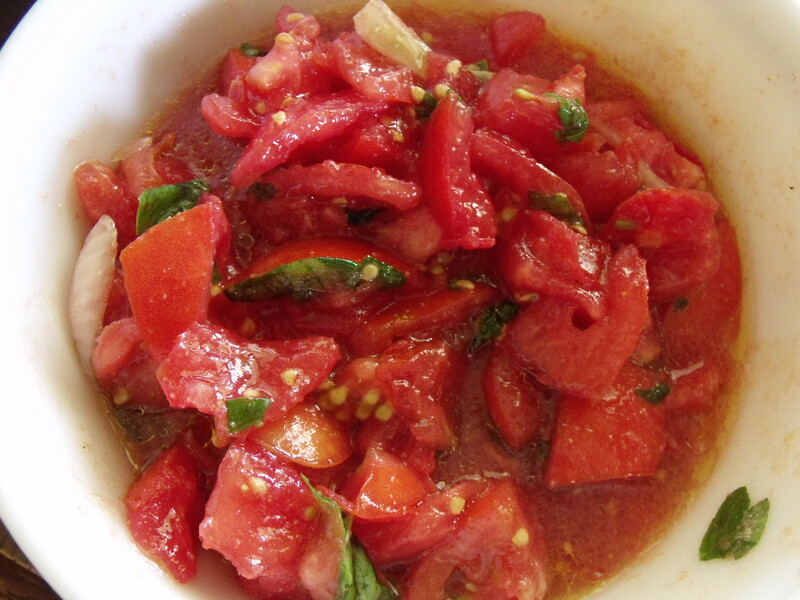 The tomatoes are coming quickly and after the salsa is finished we will can the remaining. The rest of the produce can wait for a bit in hopes that the frost won’t come too terribly soon. One thing is for sure, no one has any trouble sleeping around here! Wine and Honey. Life is good by golly!! 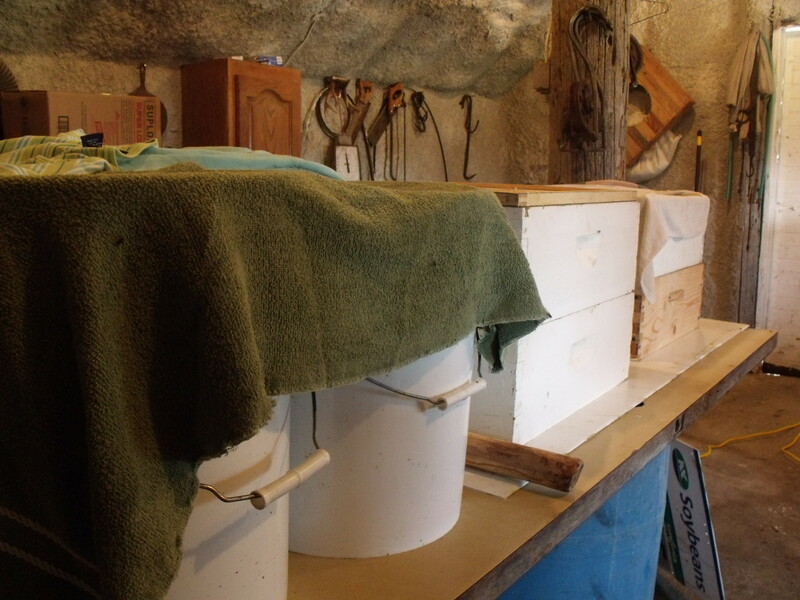 We harvested some of the honey and I think on Tuesday and Wednesday we will be harvesting again. Hauling honey supers to the honey shed. These are very heavy and Fred made the home crafted carrier. 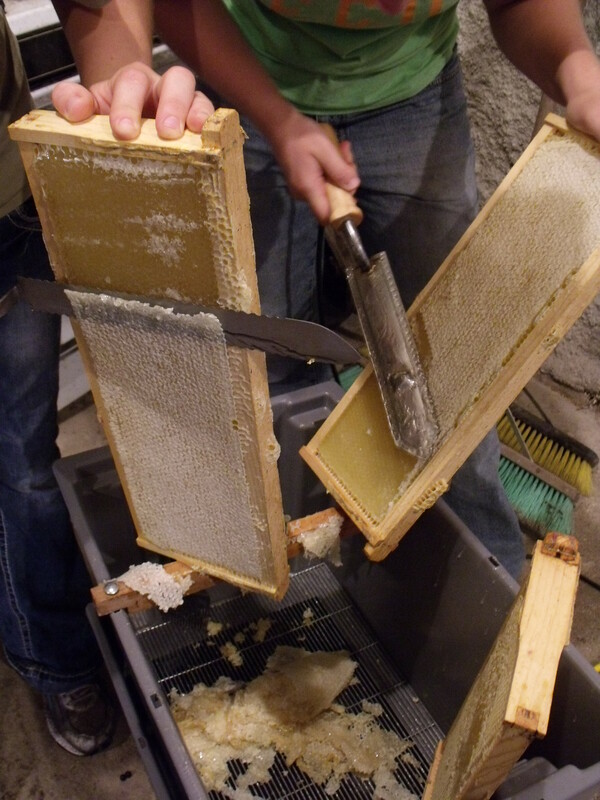 The girls are removing the caps. One with an electric knife, one with a heat dipped knife. 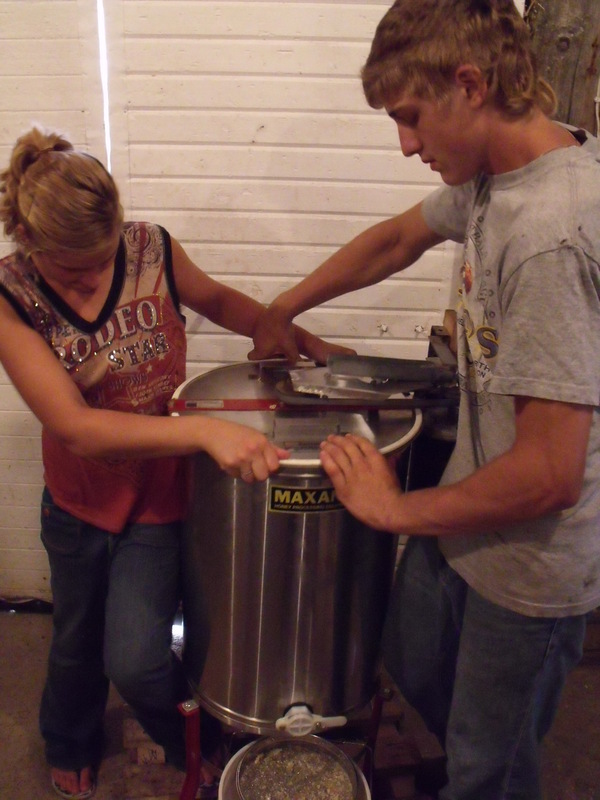 Maggie and Caleb steady and operate the honey extractor. Wow, this honey tastes amazing!!!!!! Cooking from scratch takes time but is well worth the efforts. Here is a sample of what we’ve been whipping up in the farm kitchen! I don’t have specific measurement but you can figure it all out on your own. By the way, this is why I hate to bake. You need to be specific and actually measure things!! Sausage and peppers. 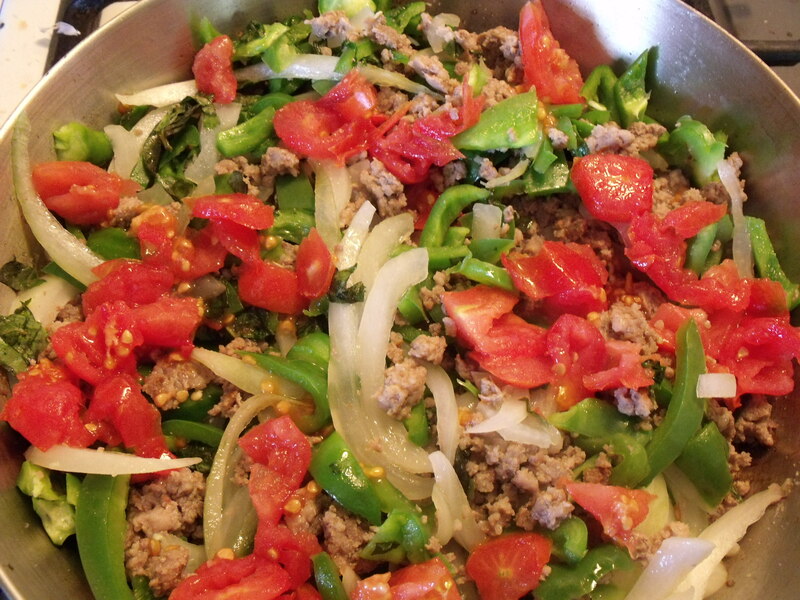 Brown pork, add onions, tomatoes, salt, pepper, garlic and sweet basil. Eat hot, cold or in a ciabatta bun with mayo. Delicious and easy. tomato salad. Simply, cut tomatoes and sweet onions. Add salt, pepper, olive oil, sweet italian basil and a ton of garlic, fresh or powder. Eat plain or with crusty dipping bread. 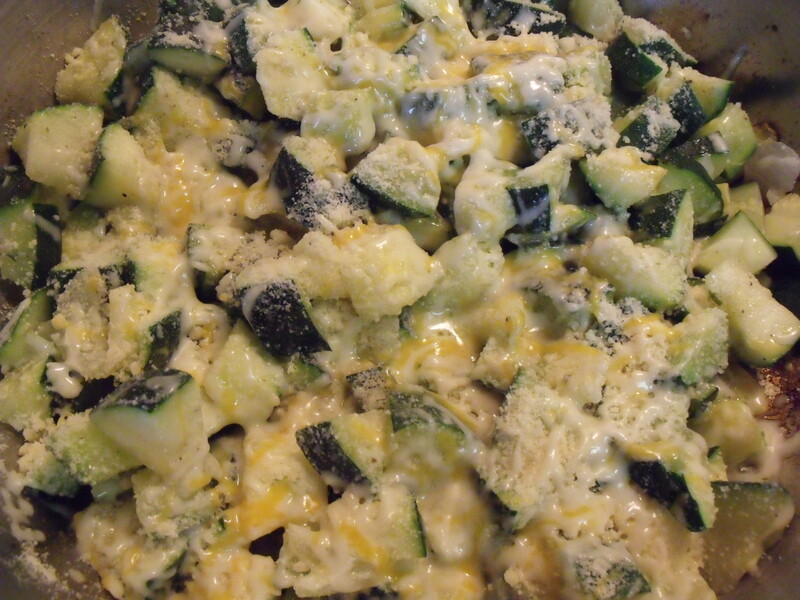 Zucchini melt. Saute tender, young zucchini and onions in butter or olive oil. When just barely cooked, add garlic, salt, pepper and top with parmesan cheese and mozzarella. Cover until melted and serve hot only. Our own beef for breakfast! My morning coffee is setting there to prove it. Our beef needs only salt and pepper served rare:) Thanks to my mom!! 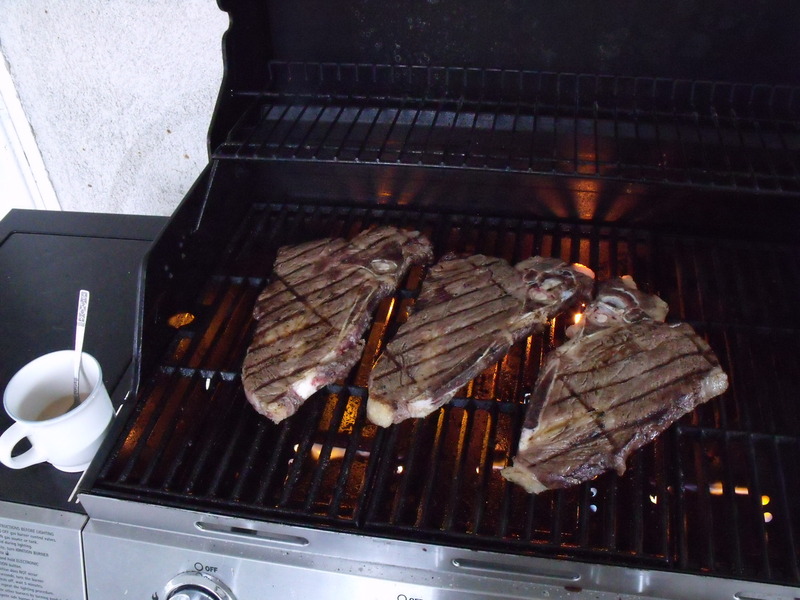 She bought us a grill this summer and we use it all of the time! Pasta and Clams. Very simply, melt butter and a bunch of slivered garlic. 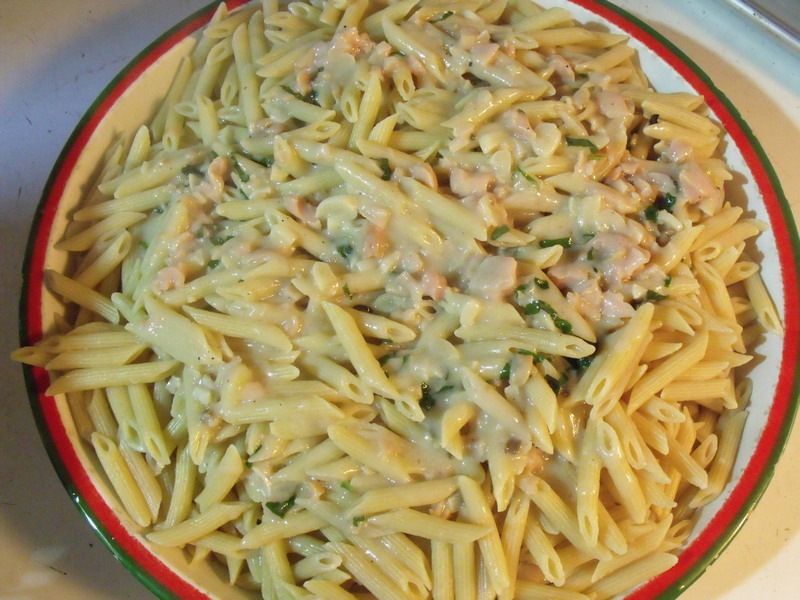 Add two cans of clams, salt, pepper, sweet italian basil and cream. Thicken the creamy mixture with a tab. of cornstarch. Pour over aldente pasta of your choice. I forgot to get this posted last week……..so this is somewhat outdated. Except for the busy part! 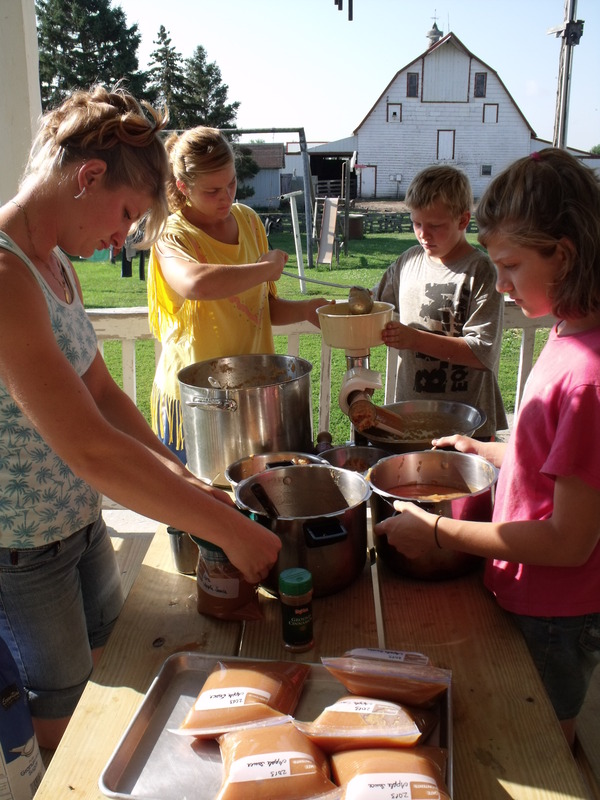 This entry was posted in FARM KITCHEN and tagged Callens honey farm, cooking from scratch. Bookmark the permalink.